Art and creation is a process and nearly always an opportunity for growth and development. Quite often, creating anything though is bound to get messy.Recently I’ve been learning how to do ceramics and wheel thrown pottery. Sometimes what I create is pretty good, and other times…..a growth opportunity and learning experience. 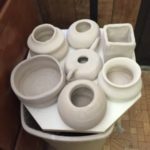 There are many life lessons that can be learned from working with clay as a metaphor and an interesting object lesson. I tried mixing two different kinds of clay together, and the resulting color was unfortunate. In spite of this I thought, maybe I can still do something useful with this and after it gets fired I can glaze it and make it pretty. 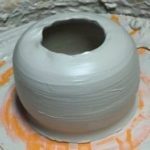 I made a stab at throwing some of this unfortunate clay onto the wheel and I didn’t get it stuck down tight. And as I began molding it, it came off in my hands. I decided to try throwing the same chunk thinking this time it would stick. It didn’t. Can we say definition of insanity? To make matters worse, it got unbalanced and flew off the wheel knocking my water bowl to the floor and flung bits of this stuff all over. My friend who’s been teaching me and in whose studio I’ve been working wasn’t nearly as disturbed by it as I was. After I cleaned up the mess I opted to do a hand building project that day instead of wheel thrown with different clay. Later as I was changing my clothes and feeling slightly dismayed by the amount and color of splattered clay, the thought came into my head that the Master potter in working to shape us into beautiful vessels and works of art got pretty dirty as well. He even bled and suffered incomprehensible anguish and pain. It was a powerful reminder of the blessing that is the atonement of Our Lord. 45 people like this post. 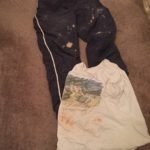 Posted by Eric Chaffey under Inspiration,Perseverance,Personal.